Like most kids from industrialised counties, I grew up with Nutella. Countless times when my mother wasn’t watching, I would dig in the familiar jar and walk away with a spoonful/s (read tablespoonful/s) of the chocolate goodness. And to this day, although I have tried different brands and types of chocolate spread, I keep coming back to the well-known Italian brand. Because whoever has tasted Nutella will tell you, it really is taste-wise the best around. However … these past few years Nutella has come into the spotlights, not as much for its taste, as well for the ingredients that go into the recipe, and one ingredient in particular : palm oil. You don’t need a PhD to know that the fabulous chocolate spread is a caloric bomb and should be consumed with moderation. Palm oil is widespread in the food industry as it is cheaper than other fats and keeps baked goods and other products soft and gooey. At the same time, palm oil has more saturated fats that oil or butter and is rarely harvested in a sustainable way. High time to try and find an alternative and why not, make one myself. Apparently I am not the only person who has come up with that brilliant idea, because a “homemade nutella” search on google will lead you to countless possible recipes. I didn’t want to try and reinvent the wheel and decided to go for the recipe Lucie from Cuisine en Scène, posted over here, which in turn was inspired by a post on Sam Tan Kitchen blog. I initially picked this recipe because it didn’t contain any dairy products which would imply having to keep the spread refrigerated. However due to some mechanical problems when it came to grounding the hazelnuts, I ended up having to add a few spoonfuls of cream to make it spreadable. My paste has therefore to be kept in the fridge. 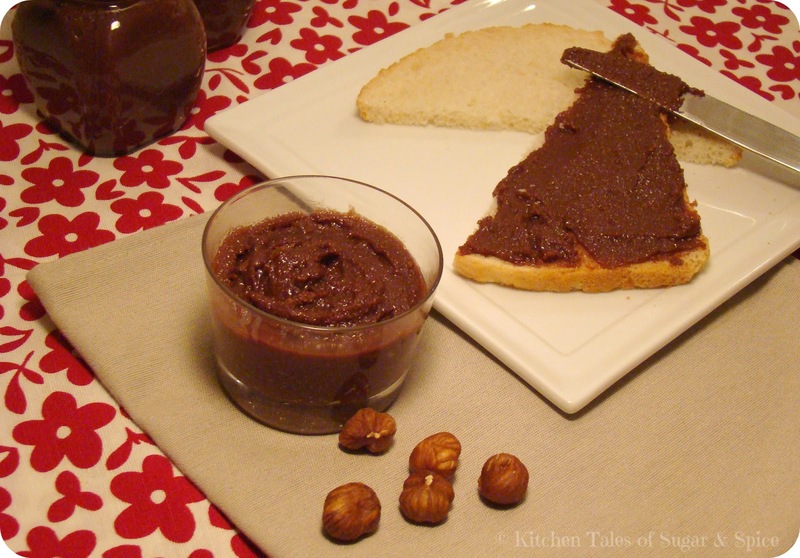 Tastewise, it is really good with a really nice hazelnuts flavour although because I couldn’t mix it to paste level, it did acquire Nutella’s smooth texture. Next time I ‘ll try Lucie’s second Nutella recipe (as her pictures look really promising) and keep you updated on the results. Roast the hazelnuts for 10-15 mins until they are fragrant and then rub them vigorously with a cloth or paper towel to remove as much of the skins as possible. Using a blender or food processor, grind the nuts until they form a smooth peanut butter-like paste. My (small) food processor overheated and I was therefore left with a hazelnut blend somewhere in between a fine meal and the beginnings of a paste. It left the final spread a but grainy, but didn’t deteriorate the taste of it in any way. Add the remainder of the ingredients to your paste and mix everything together until you have a smooth spread. 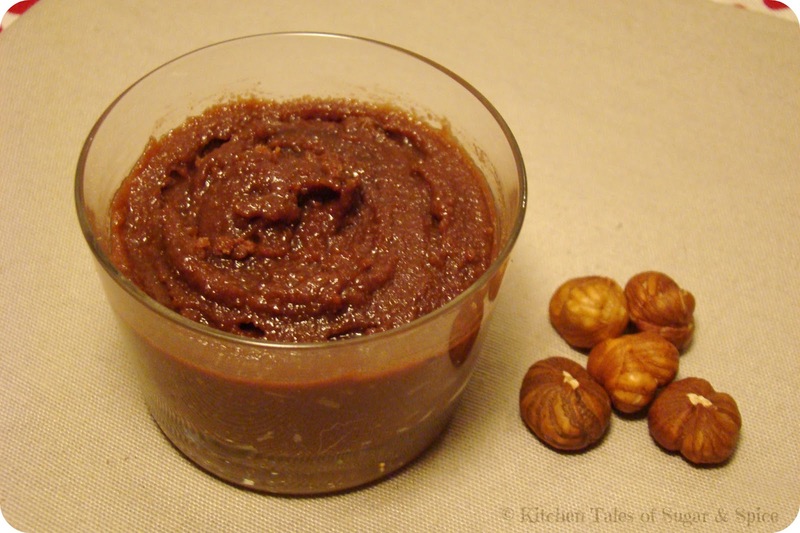 If you have reached the paste stage of the hazelnuts, you can probably omit adding the cream. My journey and transformation into a healthier me. Attempting to raise decent humans & cultivate a happy, healthy family!